MLCC technologies are providing great level of design flexibility to suppress its self-inductance by various of design configurations and solutions. Image right: Low Inductance Ceramic Capacitors LICC. Featured image source and credit: AVX Corporation. 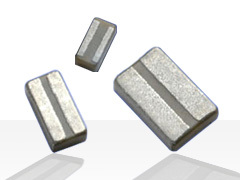 Traditionally, tantalum capacitors are limited to low frequency applications. The impressive performance of facedown (undertab) low inductance tantalum capacitors has created new applications for tantalum capacitors in power distribution networks (PDNs). For decoupling applications in high-performance digital circuits, low inductance tantalum polymer capacitors perform better than conventional ceramic and aluminum electrolytic capacitors. Other characteristics that make low inductance tantalum capacitors a suitable choice for high performance circuits include low ESR and moderately high capacitance. image credit: Kemet T528; reference technical paper is available here. Capacitors are fundamental elements in most digital circuits. Decoupling capacitors are widely used in high speed memory chips and microprocessors. Whereas a perfect capacitor is capable of transferring all its stored energy to a load instantaneously, a real capacitor cannot. The parasitic components in a real capacitor prevent instantaneous transfer of stored energy to a load. As such, the equivalent circuit model of a real capacitor has capacitive, resistive, and inductive components. These RLC components are commonly referred to as equivalent series capacitance, equivalent series resistance, and equivalent series inductance. The speed at which energy is transferred to a load is greatly determined by the equivalent series inductance of a capacitor. This speed increases with a decrease in ESL. Today’s digital circuits have higher switching speeds and demand low inductance capacitors. The demand for capacitors with very low inductances continues to grow as the switching speeds increase. Manufacturers are progressively advancing capacitor manufacturing technology to meet the performance demanded by today’s high speed digital circuits.